Kayode Fayemi's victory in the Ekiti State governorship election is a referendum on President Muhammadu Buhari's leadership of the country and defeat for the divisive politics played by Dr. Olusegun Obasanjo and Governor Ayodele Fayose, the Presidency said, yesterday. The Presidency in a commentary on Fayose, said the defeat was the beginning of the political extinction of the out-going governor and consolidation of Buhari whose personal integrity, it claimed, cannot be matched by any politician in the country. The Presidency's reaction came in the wake of celebration by All Progressives Congress, APC stalwarts across Ekiti on the victory of their candidate in the weekend governorship election. Ironically, President Buhari and former President Obasanjo were in an unusual accord in celebrating Fayemi's victory. The PDP has, however, rejected the outcome of the polls as it yesterday asserted that the results collated by its agents from the polling units indicated otherwise as it posited that results were altered in the collation centres after its agents were beaten and shut out of the centres. The PDP candidate, Prof. Olusola Eleka, at a press conference in Ado-Ekiti, rejected the result as manipulation as he warned that the APC had used the Ekiti election as a test-run for its 2019 plans to capture the Federal Government and PDP strongholds in Akwa Ibom and Rivers states. 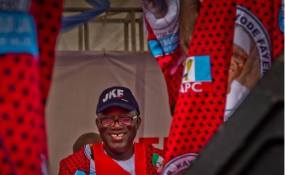 Returning Officer for the Saturday election, Prof Idowu Olayinka, had yesterday announced Fayemi as the winner of the election with 197,459 votes against the 178, 121 votes polled by second-placed Eleka. The APC candidate won in 12 of the 16 local government areas, including Irepodun/Ifelodun Local Government Area, the local government of the outgoing governor, Fayose. President Buhari in a statement by his Special Adviser on Media and Publicity, Mr. Femi Adesina, had congratulated Dr. Fayemi, INEC and the people of Ekiti on the conduct of a peaceful election. Speaking on behalf of the Federal Government, Minister of Information, Culture and Tourism, Alhaji Lai Mohammed, at a press conference in Lagos, yesterday, said the election was a referendum on the Buhari administration and a defeat for the naysayers, and fake news practitioners who he said had predicted otherwise. He said: "With the victory of the All Progressives Congress, APC, in the just-concluded Ekiti governorship election, Nigerian people have spoken, and they have spoken loudly, about their perception of the APC-led Buhari administration. "It's not just a defeat for the PDP; it's a defeat for all the naysayers who have made themselves the spokespersons for Nigerians. "Furthermore, it is a death knell for fake news! Anyone who monitored the social media before and during the election would think it would be a landslide for the PDP. But the reality is different." He said the APC-Federal Government was tempted to but refused to pay back the PDP in its own coins what he claimed was the manipulation of the 2014 governorship election. Senior Special Assistant, Media, and Publicity, Mallam Garba Shehu, in an unusual mentioning of Fayose, said the emergence of Fayemi was reflective of the popularity of President Buhari and a death knell on the politics of hate and vile as propagated by the likes of Governor Fayose and Dr. Obasanjo against Buhari and his associates. The Presidency statement read in part: "The people of the politically important State of Ekiti have spoken against their Governor, outgoing governor, Mr. Ayodele Fayose, who told them that the governorship election they just had was a referendum on President Muhammadu Buhari. He said candidates Kayode Fayemi and Olusola Eleka were pawns and that he and President Buhari were the actual contestants. "In what observers said was the most intense, and a most bitter campaign, the people gave their verdict: Dr. Kayode Fayemi, the one-time governor, declared persona-non-grata is now persona-grata again. President Buhari has won this referendum. The people of the State have sent a clear message. "The politics of brinksmanship, assaults, insults, abuses and Robin Hoodism disguised as stomach infrastructure has been rejected in favour of politics of inclusion, development, responsibility and good governance. "President Buhari's war against corruption and insecurity; the message of Agric revolution and infrastructure development and fidelity in resource allocation and management have struck a chord with Ekiti voters, who had been lied to and deceived by Governor Fayose. While the opposition continued to rant at him, President Buhari's uprightness, coupled with incorruptibility and personal integrity, unmatched by any politician in the country has again stood the test of time. "Besides reinforcing the APC's position as the only standing pole in the political landscape, it is a credit to the national leader of the party, Asiwaju Bola Ahmed Tinubu, against whom all manner of ethnic and religious opposition is being mounted by former President Obasanjo and some of Asiwaju's sworn enemies in the sub-region. "With this, the political landscape of the South-West has been transformed. APC's regional strength has been strengthened, and the Asiwaju will be respected even better. Without losing patience and decorum, the Asiwaju has proved that rivals must reconcile and come to terms or lose everything. "As for Mr. Fayose and his morbid brand of politics, it is now his time to reconcile himself to the imminent political extinction he faces, his political career sealed for good. Newspapers have mistaken him for a gadfly who creates discomfort for the government at the centre to make it better, but Fayose is a street-type thug. He never fits the role of a gadfly because he thrives on bitter enmity. Opposition does not mean a negative view of everything. Neither does it translate into a licence to abuse your superiors." The APC in its congratulatory message signed by its National Publicity Secretary, Mallam Bolaji Abdullahi, noted: "Dr. Fayemi ran an effective and positive campaign focused on his agenda of rebuilding the economy of the state and returning its lost values of integrity, prudence, and decency. "We assure the people of Ekiti and, indeed, all Nigerians, that our party is best placed to move the country forward and resolve the seemingly intractable problems that have held us back." The national chairman of the APC in his own congratulatory message to Fayemi, urged him not to embark on a revenge mission as he assumes the reins of governance, urging him to, instead, concentrate his energy on repositioning the state for progress. In a statement by his Chief Press Secretary, Simon Ebegbulem, in Abuja yesterday, Oshiomhole added that "this victory is not only for our great party the All Progressives Congress APC but for the good people of Ekiti state and Nigerians at large." "I congratulate Ekiti people for formally closing the remnants of the Peoples Democratic Party, PDP, in the South West, despite the intimidation, harassment they suffered in the hands of the out-going PDP government prior to the elections. As a party, we urge Dr. Fayemi to concentrate in earnest in the task of rebuilding the state after four years of PDP wreckage." Dr. Obasanjo also sent his good wishes to Fayemi while on his way to Beijing, China, on a visit. Praising Fayemi's victory, the former President said: "Indeed, your success at the polls after a hard-fought campaign is proof that the people of Ekiti State value your leadership and appreciate the efforts you have made thus far on their behalf," Dr. Obasanjo said in the letter dated July 15. "I salute you and all those who worked for your re-election." "You will agree with me, no doubt, that the outcome of the election broadly reflects the choice of your people, who have, by their conduct, visibly demonstrated that they cherish you and will do their utmost to make you succeed. "I urge you, therefore, to reciprocate their trust by doing everything you can to strengthen their faith in democracy and in its ability to bring about improved material conditions and better service delivery to them." The PDP has, however, rejected the results declaring that the results were manipulated at the collation centres after its agents were beaten and chased out of the centres. National Publicity Secretary of the party, Kola Ologbondiyan who addressed newsmen yesterday said that the party was in possession of the authentic results from the polling units from across the 16 Local Government Areas, stressing that the results obtained at the polling centres were not the same as those announced by INEC. "The PDP rejects in its entirety the results concocted by the APC, INEC and security agencies, in the governorship election in Ekiti state and declared by INEC. "The party rejects the falsified results and declaration of APC candidate, Dr. Kayode Fayemi, to be the winner of the election, as a daylight robbery, a brazen subversion of the will of the people and direct assault on our democracy. "From the authentic results flowing directly from the polling centres across the state, it is clear that the PDP candidate, Professor Kolapo Olusola-Eleka, incontrovertibly won the election, with very comfortable margin over the APC candidate, only for INEC to allow the alteration of results at the collation centres. "The PDP has the details of all the polling units where we won, mostly with very wide margin ahead of the APC, only for the security agencies to chase away our agents, then aid the alteration and swapping of such results with those smuggled in by the APC at the collation centres. "We have the details of the discrepancies between the authentic results from the polling units and the false figures eventually announced by INEC," the PDP stated. "We know how APC conspired with INEC to bring in card reader machines belonging to Kogi, Lagos, Ondo, Oyo, Ogun states into Ekiti state to enable APC members from these states to vote in Ekiti election with ease. The party publicity scribe also noted that the party was still putting its findings together to determine the next course of action. The PDP's stance nonetheless, there was wild celebration in Fayemi's hometown of Isan in Oye Local Government Area yesterday. Teenagers, youths, women, and men trooped into the country home of the governor-elect singing and chanting various slogans to felicitate with him on his electoral victory. Youths and commercial drivers stormed the streets chanting victory songs, dancing and waving the broom, the symbol of the APC. Some youths were seen sweeping the road as a sign of sweeping away the remains of the PDP in their communities. Reports had it that the jubilation in Ado Ekiti, the state capital took place simultaneously in other council areas of the state. Residents in towns and communities before and after lsan, trooped to the streets rejoicing. They marched to his country home with banners welcoming him back the second time. Officers of the DSS and other security agents were hurriedly deployed to the Government House and other strategic places within the town and many government offices and parastatals in Ado Ekiti. Meanwhile, the Governor-Elect, Dr. Fayemi has described his victory as a symbol of liberation from hunger, poverty, and indignity suffered by the people of the state under the Governor Fayose led administration in the state. Fayemi said the victory marked the beginning of collective rescue mission of the state from mis-governance foisted on the state by Fayose. He spoke at the secretariat, located in Ajilosun Area of the state capital, shortly after a victory rally organised in his honour by his party. He also appreciated fellow contestants in the governorship race for enriching the process and for their civility and patriotism in accepting the outcome of the exercise. The victory rally which started from the Fajuyi area of the state capital, had the mammoth crowd dancing and singing victory songs. It held traffic for several hours as the crowd appeared not in a hurry to leave the streets, despite the light drizzles. On his part, the PDP candidate, Prof Eleka has vowed to reclaim his mandate by seeking legal redress. Addressing newsmen in his office in Ado-Ekiti, Prof Eleka accused the INEC of manipulating the exercise in favour of the APC candidate. His words: "You are all aware of the unfortunate and dangerous events of the past 24 hours, in which our governorship election was hijacked by political desperadoes leveraging on federal might to pervert the electoral process, subvert the will of Ekiti people, and viciously steal the mandate willingly and freely given to me on a massive scale by our people. "PDP and I won the election overwhelmingly, receiving more than 70% of lawful votes cast and winning in almost all of the State's 16 local government areas. I, therefore, reject the falsified results being bandied by the Independent National Electoral Commission, which purportedly gave the election to the All Progressives Congress and its Candidate; Dr. John Kayode Fayemi. This is the most audacious electoral robbery of our recent history. It shall not stand. By the grace of Almighty God and your support, I will pursue and regain my mandate. "On Saturday, July 14th, the security agencies and INEC upped the ante, threw all caution to the winds, went back on their promises to be impartial and to conduct credible elections; they sided with APC and Fayemi to the chagrin of our party, myself, and the good people of Ekiti State. Despite the alarm we had earlier raised, the security agencies not only supported but also supervised the indiscriminate arrest of our party leaders and agents. "INEC on its own part reneged on its promise to have results counted, declared, and pasted on the wall of each polling station. There was nowhere INEC transmitted results from the polling centres as earlier promised. Ballot boxes were illegally moved to INEC offices while our agents were disallowed from following the process. "INEC also allowed late voting by APC in hideouts when it was obvious the figures still would not add up after all the infractions mentioned above. Still, when all of these shenanigans still failed to give them the figures they needed, they stopped the announcement of results ward-by-ward, caused a deliberate power outage at the collation centre, with no alternative source of power provided for a long time, and then wrote results in favour of APC and its candidate. "Without a doubt, what has played out in Ekiti is the APC template for the 2019 General Election, where they have mapped out Rivers and Akwa Ibom as states they must capture at all costs like they are now trying to do in Ekiti. It is now left for the opposition and opposition figures, most especially presidential hopefuls in 2019, to stand up to be counted in the struggle to roll back President Muhammadu Buhari's creeping fascism or throw in the towel without a fight. "This is not just a sad day for Ekiti but also for democracy in Nigeria. Nothing demonstrates this better than the gloom that has enveloped our dear State since they announced their convoluted result."